The new Hartford Line schedule, which goes into effect on Monday, November 12th, includes an extra morning trip to and from Springfield every day. On weekdays the new train arrives at 9:47 am and departs at 10:40 am on weekdays. Another adjustment to the timetable is the earlier weekday departure for Amtrak Hartford Line train 451, which will now connect with Metro-North train 1529. This combination of trains will allow for an arrival in New York City (at Grand Central Terminal) at 8.35 am. 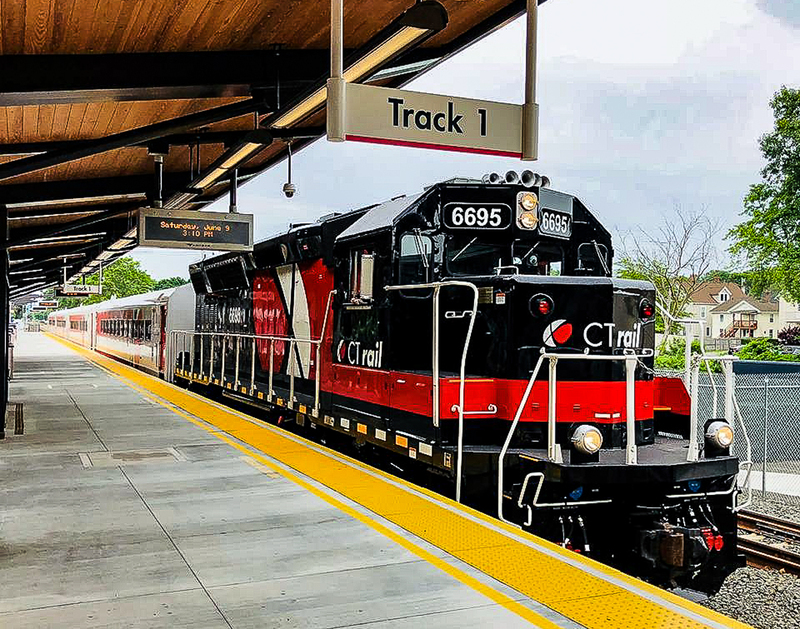 Improvements in the new schedule came as a result of the completed installation of a second main line track between Hartford and Windsor in Connecticut, as well as schedule adjustments by Metro-North and Amtrak. Printed copies of the new timetable have been shipped and should be available at locations in our region early next week. As reported in the previous issue of the Rail News Roundup, the number of people showing up at some stations along the line is, at times, exceeding the number of available seats on some of the Amtrak-operated Hartford Line trains. Why has this been happening? Because Amtrak only operates two-coaches on most of their Hartford Line trains. It is our understanding that Amtrak has now added a coach to *one* of its train sets on the Hartford Line, which has for the moment, has eased over crowding on some runs. On Friday November 11th Senator Richard Blumenthal (D-CT) hosted a press briefing in New Haven to announce steps that he is taking to pressure Amtrak into adding seating capacity on its trains on Hartford Line trains. On this Friday Blumenthal also released a copy of a letter that he has sent to Amtrak CEO Richard Anderson. “While we never desire to restrict customer utilization of our trains, for the safety of our passengers and employees, crew members may ask passengers to wait for the next available train, instead of creating an unsafe condition, such as standing in the vestibule. Amtrak and Connecticut DOT are working together to source additional equipment to help ease overcrowding and Amtrak has temporarily added some capacity on one of the New Haven-Springfield trains where we have experienced overcrowding. Unfortunately the Amfleet coaches that Amtrak uses on the Hartford Line are stretched thin across Amtrak’s network. Any coaches added to Amtrak’s Hartford Line trains would most likely mean that coaches would need to be taken away from other Amtrak trains. The long-term solution will be for CTDOT to procure additional train sets (engines and coaches) to meet the growing demand for service on the Hartford Line. Many would argue that Tuesday’s election results have changed the political equation for moving East-West passenger rail forward. The two critical players are now Representative Richard Neal (D-MA 1) and Representative Jim McGovern (D-MA 2). Neal’s district covers Springfield and the Berkshires, and McGovern’s district stretches from Worcester to Northampton. Come January, Neal will be in line to become Chairman of the Committee on Ways and Means and McGovern should become Chairman of the Rules Committee — two committees with significant power in the House. Any spending bills, including the long-awaited infrastructure package, would go through Neal’s committee. The Globe story also reported the news that MassDOT has selected the consulting firm WSP USA to carry out the planned Boston–Springfield–Pittsfield Passenger Rail Study. The Olive Street Parking Garage is now open! The 270-space, four-floor garage, which has been a decade in the making, adds significant parking capacity in the core of the downtown area of the city. It also has the potential of becoming the parking location of choice for people who drive to Greenfield to take the train from Greenfield, since the Olver Transit Center is right across the street from the new garage. Note that parking at the garage will be free until the end of December. At the moment it is not clear whether the city will continue to operate the Long-term Transit Parking area that is located in the surface lot on Hope Street, where you can park for just $5/day. Stone Arch Bridge on the Connecticut River Main Line | Bernardston, Mass. In September 2018 MassDOT and its contractors completed a complicated project to re-deck the viaduct that carries the Connecticut River Main Line across the Fall River in Bernardston, Mass. The historic viaduct, which is locally known as the Stone Arch Bridge, was built in 1846 by the Connecticut River Railroad. Most of the work on the structure was performed during a scheduled five-day service outage that commenced on September 7, 2018. The wooden ties that are the subject of these fines were removed along Pan Am lines lines in our region over the past few years. This article provides an excellent overview of the many efforts underway to expand passenger rail service in the Berkshires – a region that today is only served by a single long distance train. Note in particular the focus on “last mile” travel options in Pittsfield for people using the Berkshire Flyer service, which is to start in the summer of 2020.